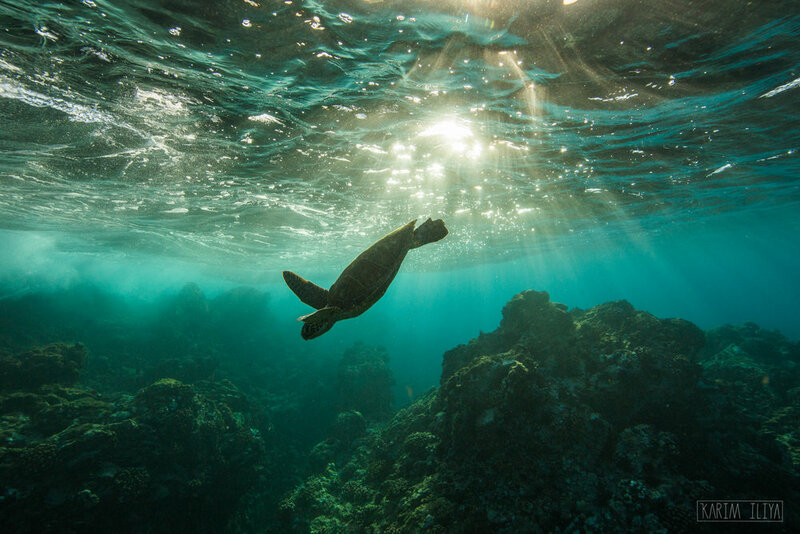 A Hawaiian Green sea turtle cruising through the shallows off Maui, Hawaii. At the beach near my house in Hawaii, their favorite place is just under the waves in the path of surfers. They seem unconcerned by the turbulence and chaos going on around them. Beneath the waves is the most abundant sea grasses and algae, food for the turtles. In the evening time, they come up slowly and heavily onto the beach to sleep. But photographing sea turtles at the beach near my house requires one to be constantly alert. There are surfer’s overhead and a surfer’s fin could cut your head badly. It can also be very shallow and being rolled by a wave onto the reef will leave a person bleeding. However, the resulting images are worth the risk. In order to photograph sea turtles beneath the waves, I practice the art of freediving. Freediving is when you dive down on a single breath of air without any scuba equipment. With only mask, snorkel, wetsuit, weight belt and very long fins, I take a deep breath and plunge into the ocean. As a human, oxygen is a requirement, and unless you’re a fish, it’s in short supply underwater, and so when I cannot hold my breath any longer, I must leave the scene I was photographing, and come back to the surface to breathe. The turtles however, can hold their breath for much longer than me. 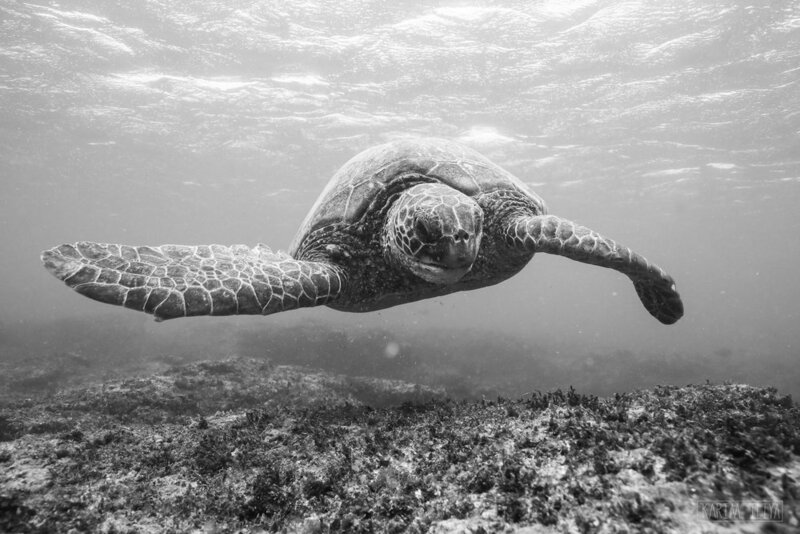 While I can only hold my breath for 1 -2 minutes, Hawaiian green sea turtles are said to be able to spend 5.5 hours underwater on a single breath of air. Aside from eating the algae on the coral beneath the waves, Hawaiian green sea turtles live interesting lives. In some places, the turtles sleep underwater. You can find them tucked underneath a rock or coral. There are also some turtle cleaning stations, where turtles will arrive, slowly flying through the water like a spaceship, and land on coral or sand. A group of fish will surround the turtle as it sits patiently eating algae, off its shell. But life as a Hawaiian green sea turtle does not come without struggles. Some turtles are missing fins from boats, nets, or sharks. Often they develop tumors on their face called fibropapillomas tumors. These tumors occur naturally but are believed to be expedited by nitrogen rich runoff, a result of pollution after rain from farms, agriculture, and golf courses on the islands. When photographing sea turtles, I have learned it is best to approach slowly. Too quickly and they will swim away, annoyed or scared. Like birds they will fly into the distance and be gone from your sight within a few seconds. It is a fine balance to approach slowly, however if done right, one can approach face to face and watch these animals living their lives. 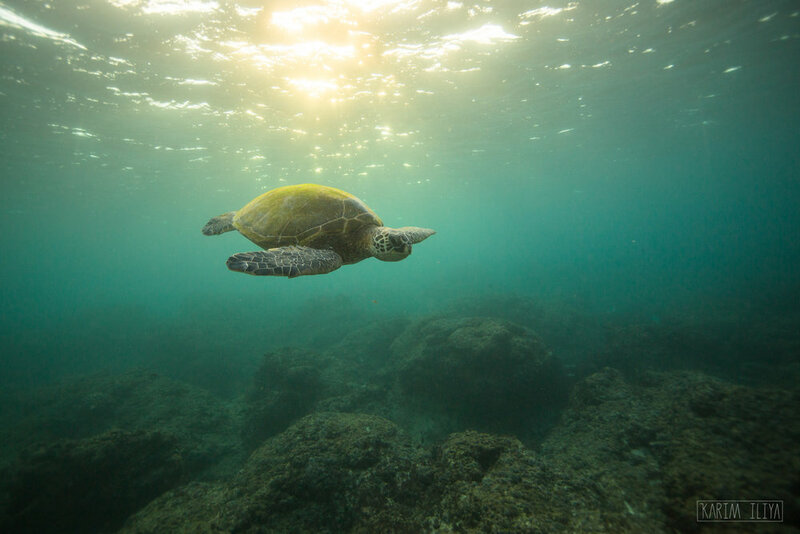 While the population of Hawaiian green sea turtles is doing very well, other turtle species like the hawksbill and leatherback are having much more trouble. Some turtles eat jellyfish. This can be a problem as garbage bags drifting in the current can look like jellyfish, and when eaten, the plastic in their stomach can kill them. Turtles are one of the most beautiful animals in the water, gliding through the oceans like birds. They have lived on this planet for 157 million years, long before humans. It is important that we do our part to ensure their continued survival.